Heading into the game the defending champions boasted a perfect five wins from five games to start this season faced an Old Road side who are finding their first season in the Premier League difficult showed immense resistance to a potent attack for most of the first half. The deadlock was however broken in the 45th minute by Donroy Liburd to give Cayon a slight lead going into Half-time. Shortly after the break Cayon’s lead was doubled through a Shavene Boston finish in the 49th minute to ease the anxiety amongst the Cayon fans. 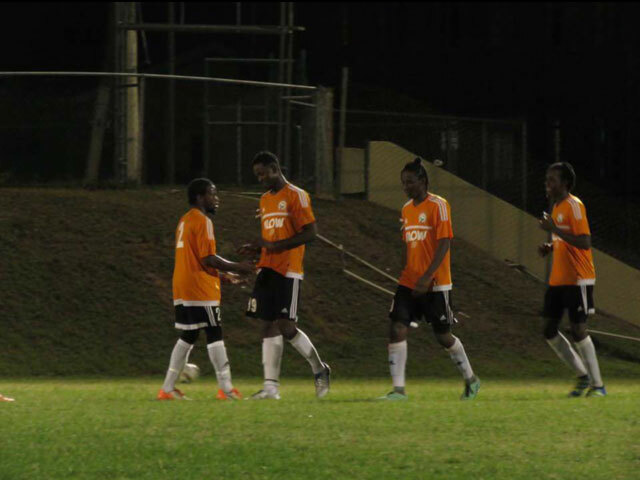 In the 74th minute Shaquille Pringle completed the defending champion’s route to complete the comfortable 3-0 victory. Later on SundayWinners Circle Newtown United who led the league for most of last season, recorded their first win of the 2016 season with a narrow 1-0 victory over ELCO Limited St. Peters. Following an infringement in the area, Newtown was awarded with a penalty that was successfully converted by Ian ‘Rumpy’ Lake in the 14th minute. However, Newtown fans nervously watched the remainder of the game as their team bid to hold on to their slender lead. Some fans even joked for the referee to call of the game early as their desperation for a win grew. They were however successful in securing victory for the solitary goal and record their first victory of the season. On Saturday Hobson Enterprises Garden Hotspurs bounced back from their first loss of the season and their first defeat in 25 games dating back to last season with a 4-2 victory over Delta Petroleum Sandy Point to remain in third. Sandy Point who have been on the receiving end of some heavy defeats were behind the eight-ball early on when Kennedy Isles open the scoring with a nice finish in the 18th minute. Three minutes later Garden Hotspurs’ lead was doubled through Shervin Allen. Just before halftime Shaquille Gaiton made it 3-0 for Garden Hotspurs. However Sandy Point got a lifeline on the stroke of halftime thanks to a strike from Clyde Herbert. However Garden Hotspurs’ dominance continued after the break but struggled to put away their opportunities. In the 75th Minutes their dominance were eventually rewarded when Tiran Hanley added a fourth. Jadarnie Browne added a second consolation goal for Sandy Point late on. Saturday also saw the Rams Village Superstars having to come from behind to earn a draw against last place Fast Cash SPD United. The Superstars team got off to a quick start with Travis Sommersall opening the scoring in the eighth minute but SPD bounced back with an equaliser four minutes later through Nicquan Phipps. SPD then took a shock lead following Jermaine Trotman’s strike on 44 minutes to head into half time in the driver seat. A second half goal from Joseph Wilkes levelled the game at 2-2 but Wilkes turned from hero to zero when he was sent off just nine minutes after leaving his side to play for almost 20 minutes with 10 men. In the final game on Satuday former Champions S. L. Horsford St. Pauls United continued to show their defensive prowess with a 2-0 victory over SOL Island Auto Conaree. St. Pauls who are yet to concede a goal for the season made it six game in a row without defeat. Mudassa Howe of Conaree had to deal with the embarrassment of scoring as own goal in the 5th minute after his team faced early pressure from St. Paul’s. The second goal of the game came in the second half when Austin “Bugman” Lewis also a Conaree native but who plays for St. Paul’s gave his side a comfortable victory. St. Paul’s now sit in second 2 points behind league leaders Cayon.